While a floppy straw hat is her favorite, novelist Ane Mulligan has worn many including pro-family lobbyist, drama director, playwright, humor columnist, and novelist. She firmly believes coffee and chocolate are two of the four major food groups. Ane writes her Southern-fried fiction in Sugar Hill, GA, where she resides with her artist husband and chef son. Her debut novel, Chapel Springs Revival, was an Amazon bestseller. Chapel Springs Survival received 4 stars from RT BookReviews, Home to Chapel Springs, in May 2016. 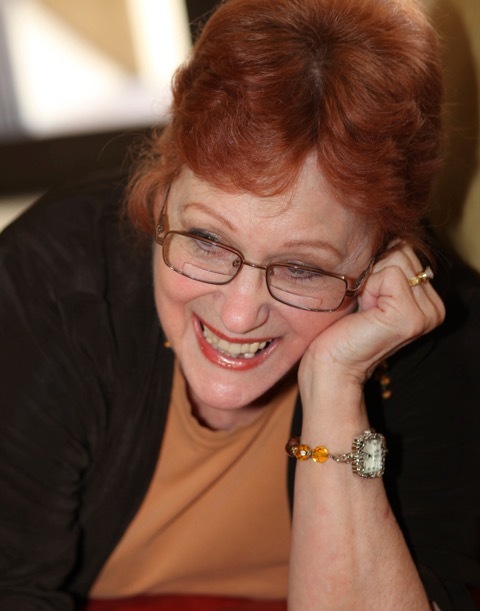 You can find Ane on her Southern-fried Fiction website. The Chapel Springs Cookbook was a fun project. My street team (fans) meets on a private Facebook group, where the often interact as the characters from my Chapel Springs series. Mayor Felix Riley (aka Mike Ehret) decided the town needed a collaborative cookbook and invited the “residents” to contribute. 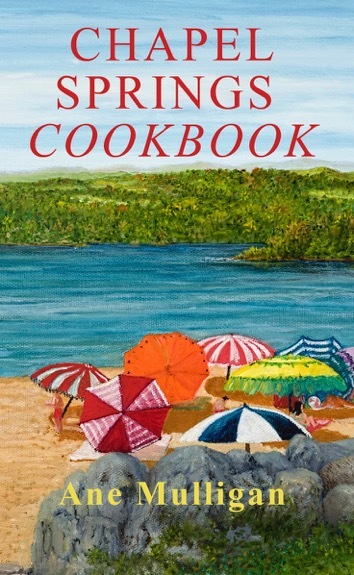 My publisher loved the idea and published the cookbook. You’ll find everything from appetizers, like Herb Cheese Stuffed Potato Rounds and the mayor’s Firehouse Chili to holiday desserts like the one found below. Good cooks surround me, and that's purely divine intervention. You see, my culinary expertise maxes out at Jell-O Jigglers. It's a good thing my hubby, Joel, loves to cook. Otherwise our kids would have gotten pretty tired of PB&J sandwiches and salad. We all have our talents, but God didn't give me a culinary gene. A number of Chapel Springs Revival readers asked me for my favorite recipes—which flat knocked me out given I can't cook. But Mayor Felix Riley liked the idea, so all my friends got together and submitted their favorites. This cookbook includes the best recipes from Chapel Springs—the dishes we all bring to town potlucks. I've had the good pleasure of tasting all of these at one time or another … well, except for one of Felix's. I wouldn't try it. But maybe you're more adventurous. At least 4 hours ahead of serving or a day ahead: Preheat over to 350º F. Grease and flour three 9” round cake pans. You can put a circle of wax paper in the bottom, if desired. In a small bowl, with a fork, combine flour, baking powder, nutmeg and salt; set aside. In another small bowl with mixer at medium speed, beat heavy cream and rum extract until stiff peaks form. In a large bowl using the same beaters, with mixer at high speed, beat eggs and sugar until thick and lemon colored, about 5 minutes. With a wire whisk or rubber spatula, gently fold in the flour mixture and whipped cream into egg mixture until blended; pour batter into cake pans. 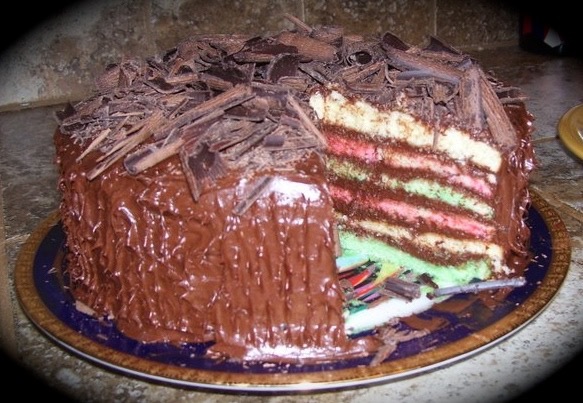 In 2 of the cake pans, add a few drops of red and green food coloring and gently blend. Stagger pans on 2 oven racks so no pan is directly over another. Bake 20 to 25 minutes until a toothpick inserted in the center comes out clean. Cool on wire racks 10 minutes; remove from pans and cool completely, about 1 hour. Meanwhile, make chocolate curls for garnish. Using the heat of your hands or in a slightly warm oven, slightly soften chocolate squares. With a vegetable peeler, shave chocolate into curls and set aside. When the cake layers are completely cool, with a sharp knife, cut each cake layer horizontally in half. I use toothpicks around the circumference of the cake layer to mark where to cut. Place first layer on cake plate, cut side up; spread with a thin layer of frosting. Set the second layer on, cut side down. Repeat until all layers are stacked on top. Make sure the last layer is topside up. Frost with remaining frosting. Garnish with chocolate curls. Refrigerate until serving time.